Disaster Movies - Poll Time! 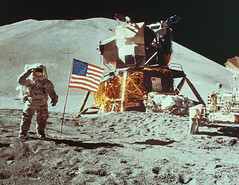 * Happy 40th anniversary of the moon landing, everyone! -- "40 Years After Apollo 11, NASA Maps Out the Future"
-- "NASA Lost Moon Footage, But Hollywood Restores It"
-- "40th Anniversary of Apollo 11 Celebrated in Liverpool, UK"
-- "Neil Armstrong Remembers Dead Astronauts 40 Years After His Moonwalk"
* Happy early birthday to faramirgirl, and best wishes for many happy returns of the day! * sittingduck1313 has been been working on a science fiction version of Diana Wynne Jones's The Tough Guide to Fantasyland. Visit toughguidescifi and check out his results! Please let me know what you think in my Disaster Movies Poll! (More than one answer per question is welcome, as are additional comments.) Thanks! Poll #1432460 Your Opinions on Disaster Movies! What's the best disaster movie about nuclear war? What's the best disaster movie about a natural/ecologial/environmental catastrophe? What's the best disaster movie about a virus/plague/contagion? What's the best disaster movie about a historical catastrophe? What's the best disaster movie about an alien or monster attack? What's the worst disaster movie ever? make us think about the things that are most important while we can still appreciate them. offer timely warnings about how we should change our ways before we bring disasters on ourselves. make us scared, and being scared is fun. panic us for no good reason. provide a useful study about our deepest fears. foster productive debate about important problems of the day. exploit ridiculous worries while obscuring important concerns. ate my mother, you insensitive clod. don't change the fact ticky-boxes are love. I bet your students had a blast with those movies! What a great idea for the classroom. That was so clever with the moon craters! Thanks for pointing that out to me (and sorry for the delayed response). It was a tossup between The Blob and Godzilla vs. The Smog Monster, but I had to go with Steve McQueen in the end. And Krakatoa, East of Java was more spectacular than Grapes of Wrath, but Henry Fonda trumps special effects. LOL! Well said. And great choices! Thanks for reminding me of these. Neither of my favourite disaster films fits into your categories, really - at least I don't think so. But I'll mention them anyway, I hope that's okay. Oh, I'm so glad you did! Great choices! Thank you. I'm trying to refresh my memory on all of these films, and I suspect the ones hardest to classify (like these) are among the most important. I'm glad you didn't mind. I think it's the far more 'real' factor about this kind of disaster film. The fact that when it comes down to it, these are the 'more likely' than alien attack, etc. And of course the Titanic did happen. If that makes any sense. Thank you for pimping my new blog. As for the Disaster Movie Poll, you forgot the option Shows that Hollywood writers don't know Jack about science. Ha! Very true. My sister was a graduate student in meteorology when The Day After Tomorrow came out, and she said that she and her pals (also in the sciences) went to the late showing and heckled the movie throughout. Apparently, even the MST3K factor wasn't enough to redeem it. LOL! Thanks for the b-day wish. I will get back to you on the poll. I can't believe I forgot about Titanic for historical and Invasion of the Body Snatchers for alien attack (And serious kudos to gbsteve for putting in my favorite horror flick, The Thing, John Carpenter flavor, that is). I'm surprised and pleased to see mjolnir1964 share my love for the much maligned Mars Attacks!, an underrated gem IMHO. I'd like to add The Invasion to the worst list, I would have but I've tried to burn it from my memory despite my love for Ms. Kidman. I'd also like to put The Happening in the worst catagory, but I haven't seen it, so that wouldn't be fair. Oh goodness, Invasion was terrible, wasn't it? I'm a huge fan of the 1956 original, and the other two remakes are both very good in different ways, but this one was an awful letdown. With the cast and budget it had, there was no excuse for that film. Yea, no excuse for Invasion at all. I think I tore it a new one in my review, even with my love for Ms. Kidman. Thankfully, as I said, I avoided The Happening, learning from the suffering reported by others. Today's WSJ has an feature on disaster flicks.